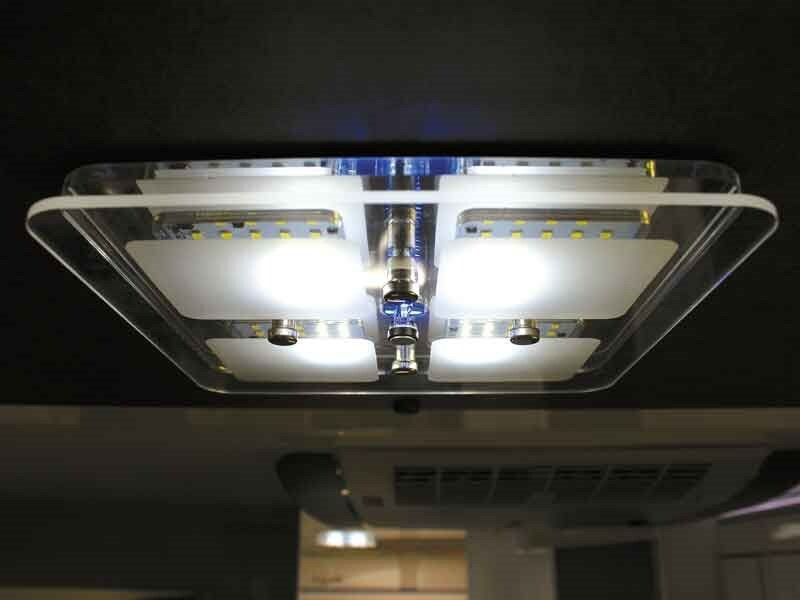 The advent of the electric slide-out compartment is revolutionising motorhome design. But then, why settle for one slide-out when you can have three? 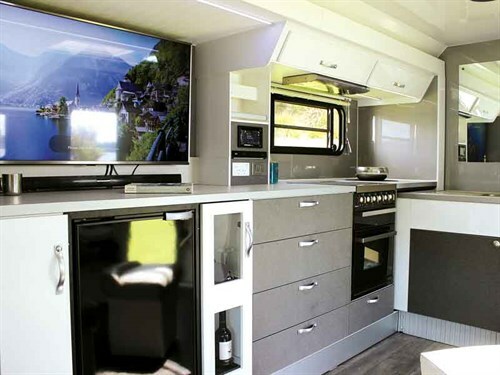 I’ve used this analogy a few times before, but after checking out Avida’s range-topping Fremantle, I feel I might have been a little premature in labelling other motorhomes of stature with the ‘apartment on wheels’ tag. The Avida Fremantle, with no less than three slide-outs increasing floor space immeasurably, really does provide for that apartment ambience. Australian manufacturer Avida make full-wall slide-out models (the Esperance and Torquay), along with a dual-slide-out model in the form of the rugged Isuzu-underpinned Longreach. That the Avida Fremantle features a triple-slide-out set up, yet doesn’t come across as an absolute bus which should only be approached by Class 2 licence holders, makes it a thoroughly usable top rung on their model ladder. Much like the famous stretch of sand it’s named after, the Avida Fremantle’s party trick revolves around providing for wide open space. Floor space, in this instance. 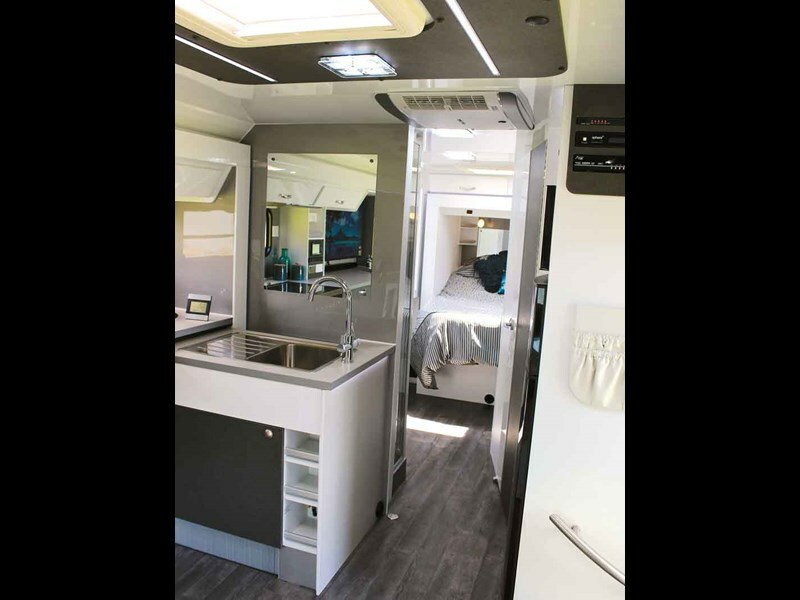 Three of the four walls of the motorhome’s living quarters feature a slide-out section. The first is adjacent to the entry door and houses a leather-trimmed sofa; there is another at the rear into which the queen bed (one of two dedicated sleeping spaces) fits; while the third – and largest – accommodates a lengthy side-cabinet featuring storage, entertainment amenities and the stainless steel stove and three-burner cook-top portion of the L-shaped kitchen area. The amenities cabinet is worth closer inspection. 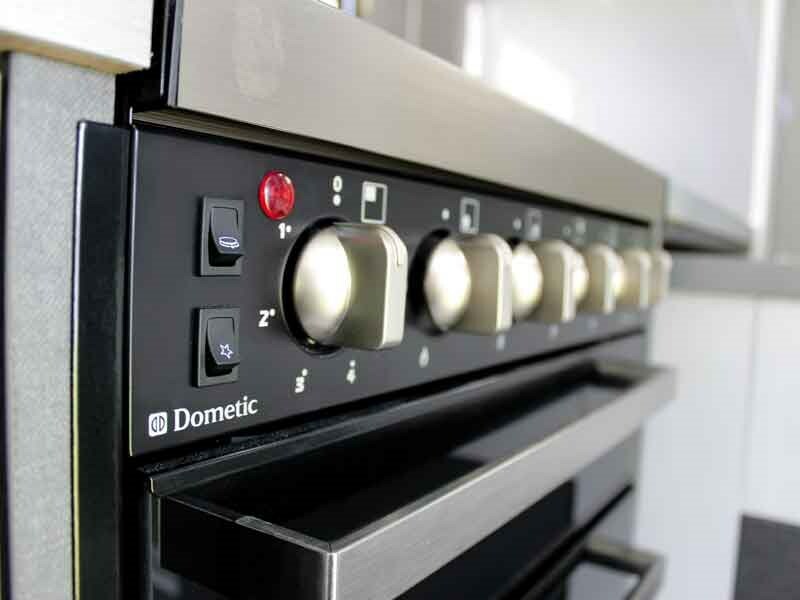 Four large drawers provide for a heap of storage, but also integrated into the cabinet is a slide-out cocktail bar (with individual die-cut recesses for glassware) and a dedicated 90-litre bar fridge. This means available room in the main 106-litre fridge/freezer opposite the kitchen isn’t compromised by that case of Church Road sauvignon blanc you just had to pick up on your way through Napier. It gets even better in the ‘lounge’ area too. The Avida Fremantle arrives with a standard 49" panel TV and slim-line LG soundbar, which replicates the sense of surround sound, ensuring you get that premium home theatre experience even when you’re out on the road. Thanks to the opposing slide-outs pushing the walls apart, watching your favourite Netflix show or DVD on this luxuriously large screen won’t have you feeling like you’ve got your nose pressed to an impossibly outsized image. After the evening meal has been dispensed with, the dining table can be removed, creating a wide open section of floor. Fully detached ottomans then act as either additional seating for a crowd or, better still, a comfy option to put your feet up for that boxed-set binge-watch. If kids/grandkids need to be put to bed in the over-cab double, a smaller supplementary flatscreen in the rear bedroom allows for the movie marathon to continue if desired (and the bed’s mattress can even be tilted electronically so occupants can ‘sit up’ for a better view). Outside, behind an integrated fold-down table, lies a third flatscreen. External speakers pipe whatever soundtrack you’ve chosen for summer outside during the day too. With the rear slide-out pulling the queen bed out another few feet beyond the back wall of the Avida Fremantle, the available space in here is exemplary too. The bathroom sits amidships, divided into two sections, with a premium finish basin and toilet to one side and showerbox along the opposing wall. Closing the dual-purpose entry door behind you creates a private bedroom/ensuite area. 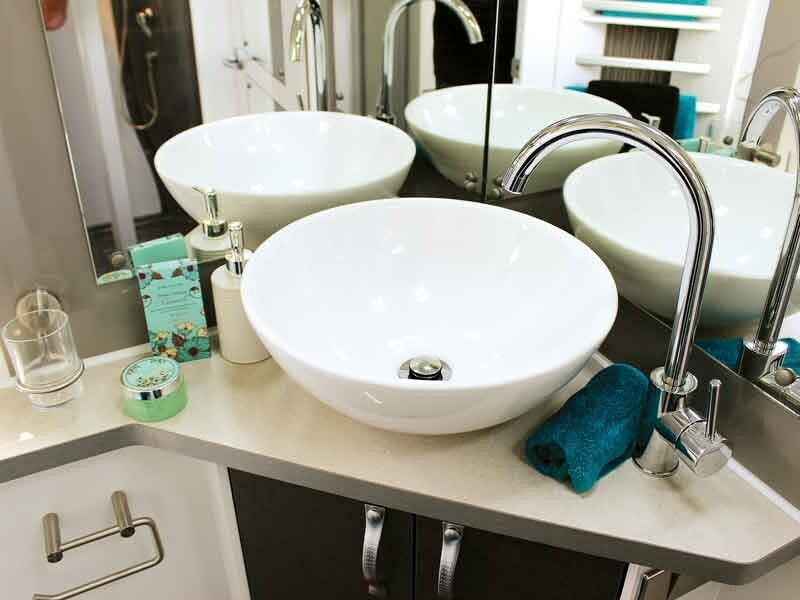 Along with an under-sink cabinet, there are shelves for toiletries in the bathroom, augmented by a large wardrobe and further bedside storage. The bed base flips up electronically to reveal supplementary seating; a clever touch. Perhaps taking that ‘apartment on wheels’ vibe a little too far for motorhomers wishing to escape the routine of domesticity, the Avida Fremantle even boasts a washing machine. Now, this will no doubt glare at you accusingly as you put off doing the washing in favour of getting through just one more chapter of that book you’re reading, but it could prove vitally handy when freedom camping, especially if that day hike route you’ve chosen to explore turns out to be muddier than you’re expecting. As mentioned, the Avida Fremantle is big, but not so big as to seem unwieldy. At 8.6m in length, it isn’t among the largest of C-Type model on the market. 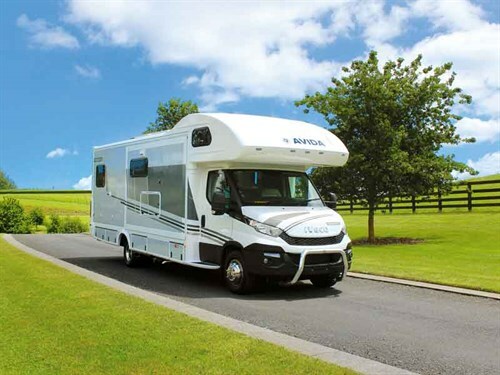 But add a bike rack or a secondary vehicle or recreational boat to the rear via the standard tow bar (the Fremantle boasts a 3500kg braked tow rating), and your motorhome will certainly still take up its fair share of tarmac. Avida has made sure there is muscle to match, with a robust Iveco 70C chassis underpinning things, matched with a 205hp (150kW) four-cylinder turbo diesel engine. The eight-speed auto makes for smooth sailing out on the open road, and with a decent 470Nm of torque available from low down in the rev range, the Fremantle will keep the pace. Our tester featured an optional nudge bar up front, as well as silver exterior side inserts for a slightly different look. 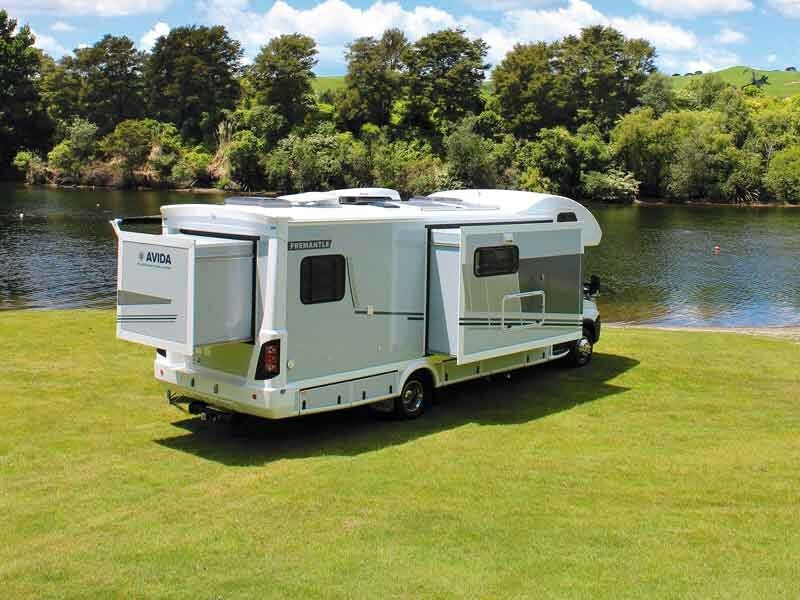 External features the Fremantle arrives with straight off the showroom floor include an electric awning, barbecue attachment, external shower, full-length roof guttering, hydraulic stabilisers, and a roof rack and ladder. 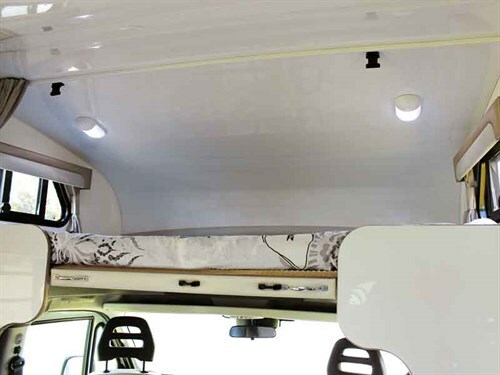 Each slide-out also comprises a handy externally-accessed storage bin for all those extras that require last minute homes ahead of your next adventure. 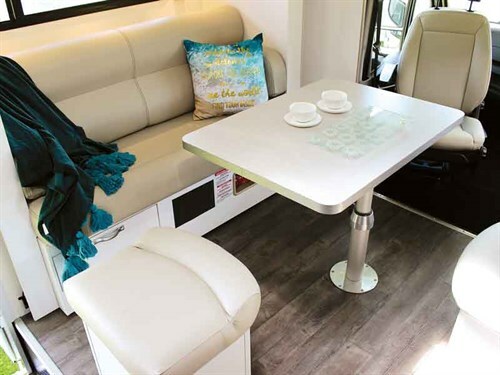 Avida remains an impressive Australian brand, with plenty of experience at packaging motorhomes designed to last the big distances the company’s domestic customers’ demand. 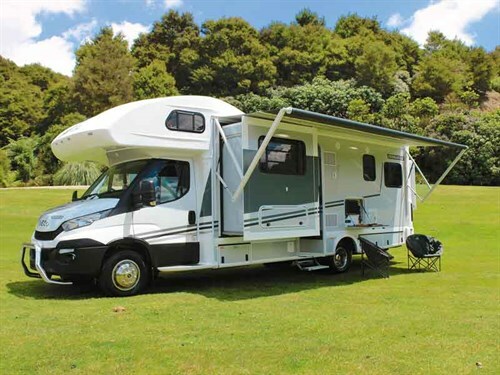 Kiwi motorhomers looking for similar solidity can reap the rewards on our side of the Tasman too. But if you know you’re getting practicality as a given, and you have the opportunity to indulge more on the ‘premium’ side of things, then the Avida Fremantle is just about as good as it gets. After two or three weeks in this, you might never want to go back to your conventional home ever again. For further info, phone Auto Leisure & Marine Group, on 07 850 5512. Benimar is a name that will appear on Kiwi roads with more frequency over the coming summer months.